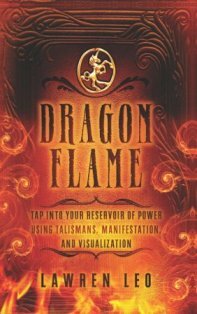 'Dragonflame' provides the reader with a magical system for self-improvement, including an underlying philosophy and methodology, combined with a series of structured rituals for the adept to perform. Although this may seem quite a large volume of material for a regular-sized paperback, the author does an excellent job of organising and presenting his material. Becoming a magician - in the old-fashioned sense of the word - continues to be a fringe activity from the perspective of most people, so the author is wise to offer words of caution. Magic is a private activity, he argues, and sharing with others risks courting doubt and negativity which may hinder the work - which the author likens to alchemists seeking the Philosopher's Stone. Lawren Leo's magical self-help guide therefore promotes an individualistic approach. Although the author has a Wiccan background, he does not discuss group activities commensurate with, say, witchcraft, like covens. Instead, discretion is his watchword (p63). Lawren Leo has created a new, self-empowering system based upon a set of received magical philosophies and methods. His Gnostic approach provides an admixture of Qabalah, astrology, Tarot and the Greek mysteries, with the additional inclusion of various gods and goddesses from other pantheons thrown in for good measure. His guide is written with great clarity and care. It is succinct and focussed, reflecting the approach that our teacher is laying out before us. The Dragonflame itself provides the adept with a magical totem composed of a tri-partite chimera consisting of unicorn horn, horse's body and lion's tail (p76). The three aspects of this magical creature, which provides the blueprint for the adept's talisman, reflect Lawren Leo's metaphysical 'GPS system': Goal, Purpose, Sacrifice. Note that 'sacrifice' is not of the black magic variety, but rather the sacrifices we must make in our lives in order to achieve our goals. Thus, the work is White, High Magick, and in many ways the recommendations for personal development differ little from any other sensible self-help guide: Self-empowerment through greater self-awareness, clean living and focussed, directed attention. The difference with 'Dragonflame' is the additional usage of magical ritual, which dominates the second half of the book. These rituals are employed to invite various spiritual powers into our lives to help bring about transformation - a process undertaken with understandable care and attention to detail (pp120-5). The rituals themselves are adaptations from work that has come before, and the author similarly invites the increasingly knowledgeable and confident adept to formulate her/his own rituals over time. Lawren Leo has obtained the detailed content of the rituals and spells presented in the book from his own lucid dreams and visions (p174). He describes many of these in detail. I found his visualisations some of the the best passages in the book, freed as they are from the more structured and layered ritual descriptions. (I consider Leo's combination of inner psychic freedom and structured ritual to be a sort of Yin/Yang mixture of New Age and Old Magic influences). Where I parted company with the book was its emphasis on attaining certain material goals. Whilst I accept that the author has only the best interests in mind, I've personally always found the emphasis of Wiccan and magical influences to be more properly directed to the interface between humans and their environment - the changes of the seasons, heavenly cycles, a sense of place within the comings and goings of the natural world. Whilst rituals clearly have a part to play to structure magical discipline, I think they are only one part of a wider sense of communion with nature and any spiritual influences that work through that broader environment. I struggled with the concept of adepts locking themselves away with their altar and magical paraphernalia in order to pursue personal advancement within the human world. But Magic provides a number of paths, and Lawren's Leo's journey through the inner realms of vision and lucid dreams surely enhances transformation and growth in a way that can act as a template for many. His exploration of the Qabalah and Tarot in particular provide a structured path through inner dimensions and along astral connections. Subtitled "Tap Into Your Reservoir of Power Using Talismans, Manifestations, and Visualisation"